Anthony Watson has scored 15 tries in 36 Tests for both England and the British and Irish Lions. 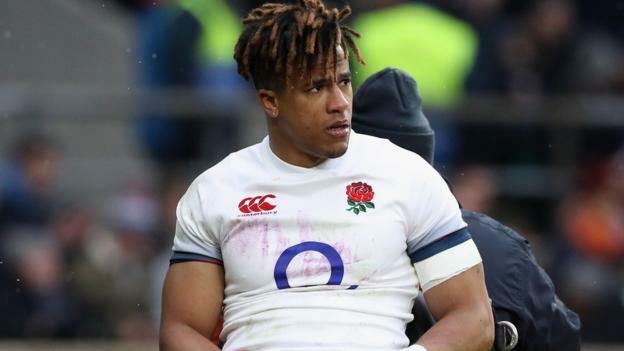 England and Bath back Anthony Watson required a second operation on his Achilles tendon after re-tearing it during a commercial photo shoot. The 24-year-old has not played since suffering the original tear playing for England in their Six Nations defeat to Ireland in March. The original prognosis was that he would be out for six months. But it has emerged Watson’s Achilles ruptured a second time during a photo shoot with NFL players six weeks ago. BBC Sport understands the player took a couple of steps to catch a ball, causing his Achilles to tear again. Bath say his injury was re-assessed and it showed the rupture had failed to knit after the initial surgery and the player was therefore “unlucky” to suffer further damage. The club are confident the Achilles has now has been repaired and Watson’s agent says the player is on course to return at the end of the year or early January. Next articleDear Louis C.K. and his apologists: We do not trust you. Is China persecuting its Uighur Muslim minority?